It’s been 12 years since Kubrat Pulev last fought in the United States, that moment coming in the 2007 World Amateur Championships tournament in Chicago, Ill.
Armed with a contract deal with Top Rank and ESPN, Saturday’s stateside return figures to be the first of many in the near future for the veteran heavyweight contender. 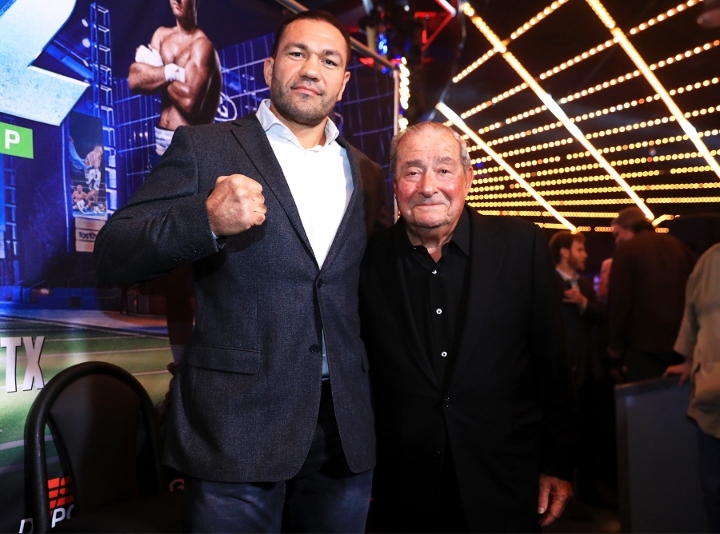 Bulgaria’s Pulev had recently fought under the Epic Sports banner, including his ESPN+ streamed win over Hughie Fury last fall. The streaming rights to the bout were secured by Top Rank an ESPN, who entered a co-promotional agreement with the 37-year old heavyweight shortly thereafter. It was a calculated signing by Top Rank, as Pulev now serves as the mandatory challenger to one of the heavyweight titles currently in the possession of England’s unbeaten, unified titlist Anthony Joshua. Saturday’s clash with Romania’s Dinu (18-1, 14KOs) will mark his first under the agreement, falling right in line with the plan to further develop Pulev’s brand and get him some much-needed ring experience ahead of his second career title fight. Time will tell whether he lands a shot at Joshua or is instead steered towards a lucrative showdown with another unbeaten Brit in Tyson Fury, who joined the ESPN family in February. Until then, the plan is simply to fight far more often and become a far more familiar name, particularly in the United States. It comes across as a lofty goal for a 37-year old heavyweight, but the belief on their side is the timing is much better now than when he was a younger contender. “I am much smarter and much stronger, even then when I fought Wladimir Klitschko,” Pulev says in growing since his lone career loss, a 5th round knockout versus then-World champion Klitschko in Nov. ’14. “That loss, I wasn’t ready for that fight. I learned a lot from it, and you have to be a smart boxer in today’s heavyweight division. Kubrat Poo-lev struggled with HUGHIE FURY, for chrissake. if he looks good tonight, i would like to see him in with adam kownacki next. with a crack at a beltholder on the line. but it looks like pulev is gonna get a shot anyway. He's a star in Bulgaria, but unless Americans have suddenly become more receptive to the jab and grab then I don't Pulev making much of a splash here.